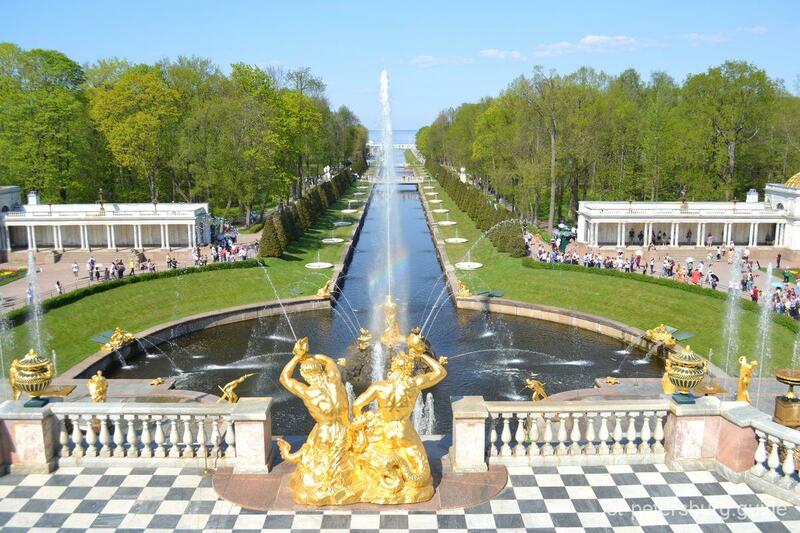 Peterhof is the “world’s capital of fountains”, a tremendous extravaganza of water and gold, marble and bronze. Concentrated on its territory of 117.5 hectares (290 acres) are several palace ensembles (the Great Palace with the Upper Garden and Great Cascade, the Lower Park with the Monplaisir, Hermitage and Marley palaces) and more than 150 fountains forming a unique complex unparalleled for the scale, beauty and sheer power of the watery show. The history of Peterhof goes back to 1705, when Peter I’s snow [two-masted ship] Munker dropped anchor off the shore of the Gulf of Finland at a place called Popova Myza, some 40 kilometers (25 miles) from newly founded St Petersburg. The spot gave a good view of the large island where the Tsar was building the Kronslot fortress. Here, a little to the west of today’s Marley, a wooden house was put up for Peter that is mentioned in 1708. 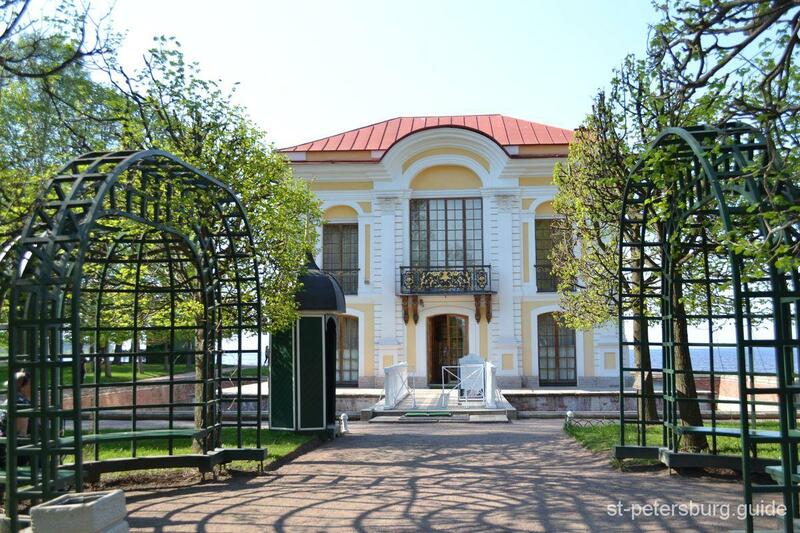 The first steps in converting this modest stopping place into a grand residence were taken in 1710, the year after the Great Russian victory at Poltava, but they were scaled up substantially after the Tsar’s diplomatic visit to France. Peter arrived in Paris in early May 1717 and stayed there until the end of June. The Duke of Saint-Simon noted that the Tsar paid particular attention to the royal suburban residences of Versailles, Trianon, Choisy and Marley. Before 1717 was out, the French architect Jean-Baptiste Le Blond, who was in charge of the work at Peterhof and was tackling the problem of providing the planned fountains with water on Peter’s orders, submitted for the Tsar’s consideration a plan in which he proposed supplying water by means of a watermill and a horse driven machine from the Hunting Marsh (now Olga’s Pond). But this plan was rejected due to its awkwardness and high cost. 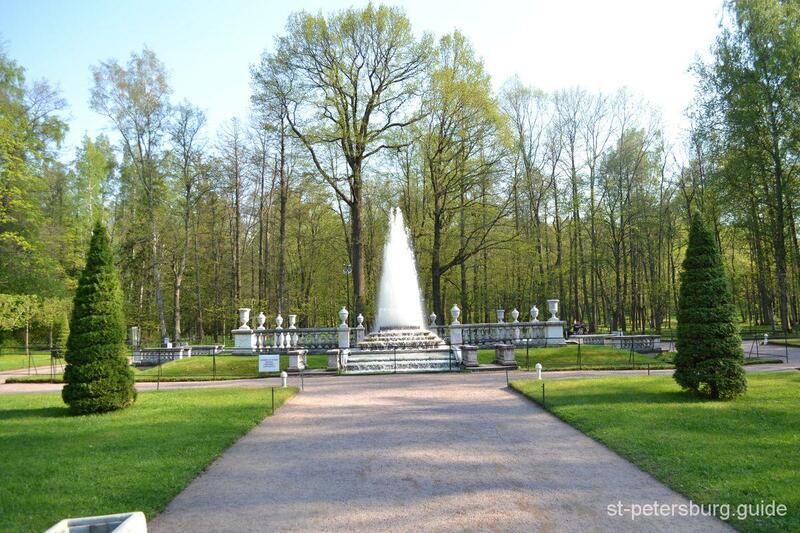 In early Au­gust 1720 Peter personally inspected the springs located 70-100 meters above sea level on the northern slopes of the Ropsha Heights, some 20 kilometers south of Peterhof. 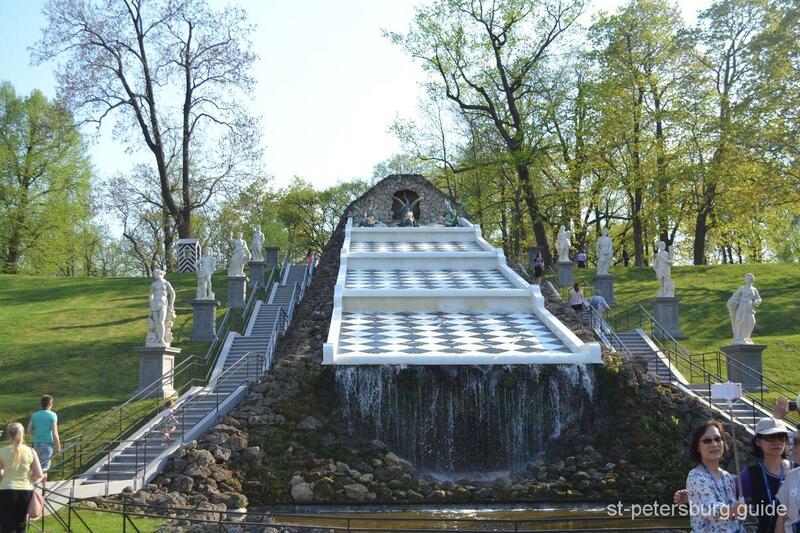 He decided to construct a canal along which the spring water would flow to Peterhof under the force of gravity, supplying the necessary pressure for the fountains. Construction of the conduit was directed by Vasily Tuvolkov, one of the young men that Peter had sent to Western Europe to study (he acquired his particular skills in Holland and France). The construction of the Ropsha Canal was completed by early August 1721 – in just eight months. Peter I was eager to have the Peterhof fountains working for the festivities to mark the end of the Northern War in 1721 and the first trial start-up took place on 13 July, a month and a half before the signing of the Peace of Nystad (30 August). On 8 August 1721 Peter I, accompanied by foreign guests and a host of high officials, set off to Ropsha and personally sent the water on its way. The abundant supply of water from Ropsha inspired extensive work to create new fountains. In 1721 the Bowl fountains were inaugurated; in 1722 water was sent to the Adam fountain and the Terrace fountains and in 17 23 -2 4 the fountains of the Little Galleries (forerunners of the Voronikhin Colonnades) were connected up, as well as the Ménage Fountains and the Marley Cloches, the fountain in the Menagerie Pond, the Pyramid and the Dragon (originally Ruin) Cascade. The 1720s saw the start of work on the Golden Hill cascade and the Triton fountain by the Orangery. In 1721 direction of Russia’s first “fountain team” was taken over by the Frenchman Paul Sualem. The grand ceremony of the public inauguration of the Peterhof fountains took place in Aug us t 1723. Friedrich Wilhelm von Bergholtz wrote that Peter, accompanied by foreign princes and a large retinue, arrived at Peterhof on 13 August, after the ceremony in which the Russian navy greeted its “grandfather” – the boat in which Peter had learnt to sail. 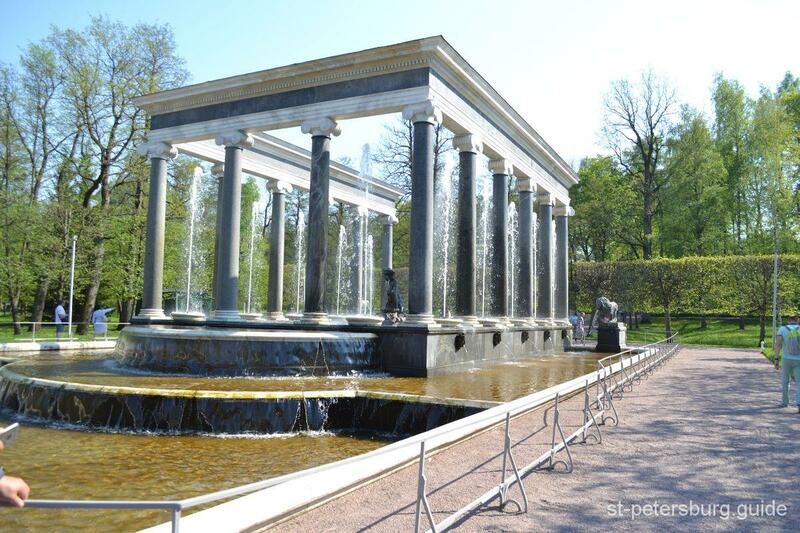 A new stage in the history of the Peterhof fountains came in the reign of Paul I (1796-1801), when the dilapidated installations were reconstructed on a massive scale. The greatest sculptors of the day – Fedot Shubin, Ivan Prokofiev, Feodosy Shchedrin, Jacques Dominique Rachette, Ivan Martos and Mikhail Kozlovsky -were involved in this work. Under Nicholas I (1825-55 ) work was carried out (from 1831) to deepen the Ropsha Canal and the New Link Canal, more than 5 kilometers long and 816 meters wide was constructed. In 1848 nine reservoir ponds were created. 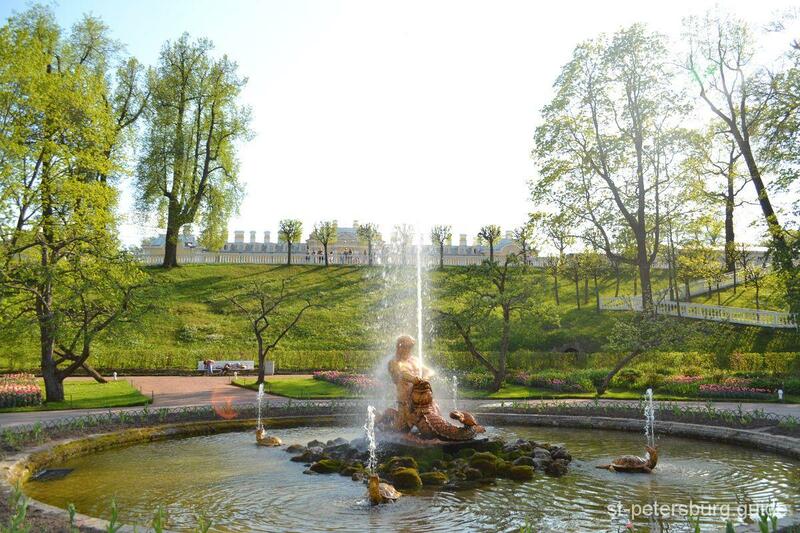 These projects were overseen by Sergei Likhardov, who had charge of the Peterhof fountain system for 29 years. He improved the system so well that it has worked ever since practically without modification. At this time a number of “historical stylizations” appeared in the Lower Park: the Lion Cascade was reconstructed with an ancient Classical look and the Marble Bench fountains appeared. At the end of September 1941, after stubborn fighting with Nazi troops, the Soviet forces were obliged to leave Peterhof. Until 1944 the town and all its palace- and- park ensembles were occupied by the invaders. On 19 January 1944, the day Peterhof was liberated, front line correspondents reported a terrible picture of destruction and desolation. The first phase of restoration work began immediately and lasted until 1973. Everything that could be was gathered up, piece by piece; what was lost was recreated from archive documents and photographs. On 26 Aug us t 1946 and 14 September 1947 the restored fountains were put into operation. 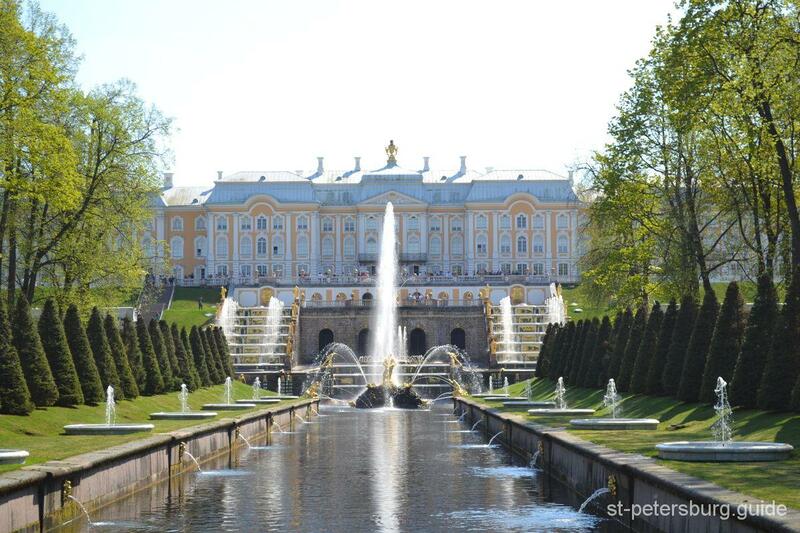 The Grand Palace of Peterhof is one of the most beautiful pal­aces in Europe. It numbers among the largest architectural monu­ments of the eighteenth century and is protected by UNESCO. Seen, from the Gulf of Finland the building, perched on the edge of a high coastal terrace, is impressive for its size and seems to float above the Lower Park. On the south side it is adjoined by the Upper Garden a strictly regular artificial landscape with large mirror-like basins of water. The history of the palace is closely bound up with the his­tory of Peterhof, which for two centuries was a crown residence of the Russian Emperors and Empresses. According to Peter’s concept, Peterhof was supposed on the one hand to rival the most celebrated residences of European monarchs, and on the other to become a triumphant monument to the successful conclusion of Russia’s struggle for access to the Baltic Sea. Both things were brilliantly achieved. 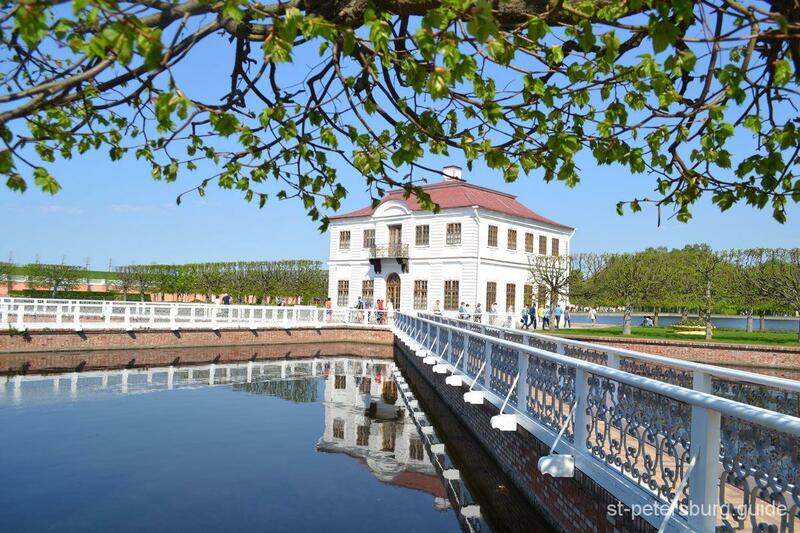 The work was conducted at an astonishing pace and as early as August 1723 Peterhof was for­mally inaugurated. By that time the main palace of the residence – the Upper Chambers – had been constructed, the 15-hectare Upper Garden and the 102.5-hectare Lower Park with the Monplaisir and Marley palaces were both laid out. The middle years of the eighteenth century saw an upsurge of Russian culture that is associated with Peter the Great’s daughter, Empress Elizabeth. he decorative richness, festive atmosphere and splendor of the Peterhof estate reached their peak in this period thanks to the architect Francesco Bartolomeo Rastrelli, the outstanding exponent of Russian Baroque who worked at Peterhof and Pushkin City for more than a decade. Following his pro­ject between 1745 and 1755 the modest Upper Chambers were expanded and transformed into the magnificent Great Palace that dominates the entire ensemble. At the same time Rastrelli reconstructed the side galleries that terminated in small pavilions and replaced the latter with splendid buildings topped with gold domes – the Church and Coat-of-Arms pavilions. Today the Grand Palace is a unique museum with stocks numbering around 3,500 exhibits. The palace halls are strikingly magnificent: painted ceilings, patterned parquet floors, a host of mirrors and intricately twining gilded woodcarving – everything glitters and gleams in a dazzling display of luxury. The main suite of halls, the state rooms of the palace, are located in the second store and are reached by the Main Staircase. This enfilade included both halls with official public functions and the elegant rooms of the private apartments to which only a narrow circle of people had access. Together they comprise a brilliant ensemble of interiors of enduring artistic and historical value. Also, you can customize a tour or book inside excursion. 1. To meet at the entrance and miss very interesting stories of the city history, its main characteristics, of what you are seeing around etc. By clicking on the "Request" button, you confirm that you accept our terms of service and agree to the processing of your personal data in accordance with the personal data processing policy. St-Petersburg.guide is the exclusive owner of all images & textual information. Reproduction of images published on the st-petersburg.guide is forbidden without written permission issued by the St-Petersburg.guide.